The Breakdown: Can Healthcare Reform Be Saved? In the wake of the surprising loss in Massachusetts on Tuesday, the future of healthcare reform has become uncertain. The Nation's DC Editor Christopher Hayes and special guest Ryan Grim of the Huffington Post explore the legislative options for next steps. In the wake of the surprising loss of the Democrats’ sixtieth Senate seat in Massachusetts on Tuesday, the future of healthcare reform has become uncertain. 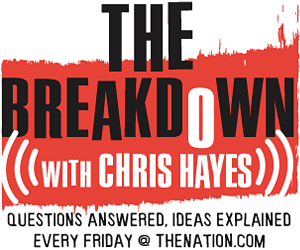 On this week’s The Breakdown, The Nation‘s DC Editor Christopher Hayes and special guest Ryan Grim of the Huffington Post explore the legislative options for next steps. More information on Ryan Grim of the Huffington Post. Experts on healthcare experts urge passage of healthcare reform, via TPM, and reporting about their letter. Ezra Klein and Lindsay Beyerstein on legislative options for healthcare reform.